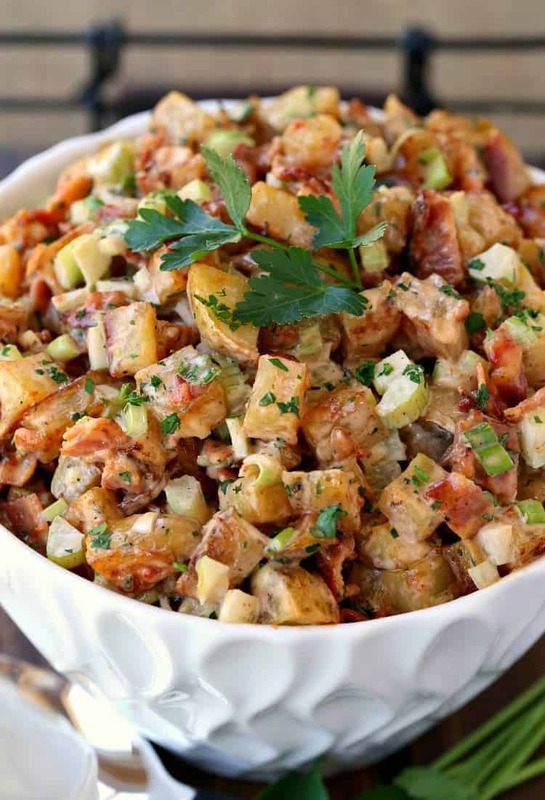 Oven Roasted Barbecue Potato Salad is the ultimate side dish! 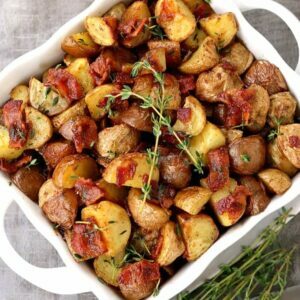 Roasted potatoes, not boiled then tossed in a creamy, sweet and spicy BBQ dressing! First of all, grilling outside and sitting on the deck in the warm weather is one of my most favorite things to do. But being on the East coast, it seems like we don’t have a lot of days like that. We have seasons. One day it’s winter and then BAM it’s Spring. Or one day it’s Spring and then BAM it’s Summer. There’s no transition, since one season seems like it dramatically turns into the next. So you have to be quick about enjoying it. When it’s time to start hanging out outside, with some good food, good drinks and friends…the menu starts to get planned out. You start by picking the main course, then move on to the sides and desserts. And for the sides? We’re kind of known for our dinner stealing side dishes…And it doesn’t seem like you can have a barbecue without a good potato salad. Am I right? Everyone seems to have their favorite recipe for potato salad so it’s always on the menu. Well I am here to make you your new favorite potato salad – hands down it’s the best potato salad I’ve ever eaten. 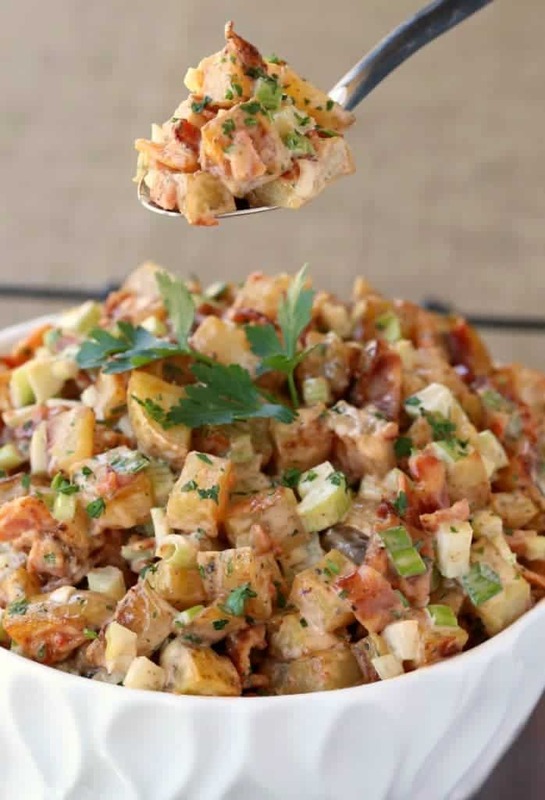 This Oven Roasted BBQ Potato Salad will blow your guests away and they’ll be begging you for the recipe, I can promise you that. It starts out by oven roasting the potatoes. One of the things I don’t like about potato salad is that mushy texture it gets from over boiled potatoes being stirred around together….not in this recipe. 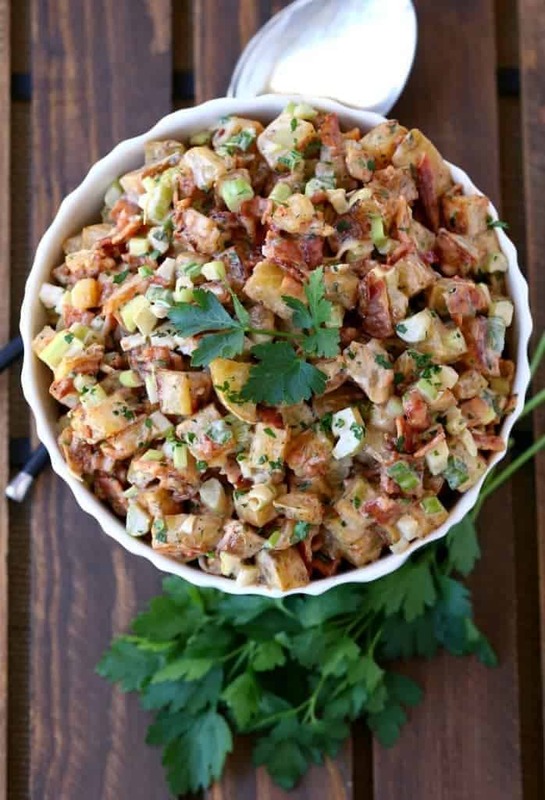 I roasted the potatoes for this Oven Roasted Barbecue Potato Salad because roasting potatoes gives them so much more flavor, if it’s a side dish or for dinner recipes – you want the most flavor possible. As a result, you get a potato salad with loads of flavor and amazing texture. That’s step one. Step two is the sauce. 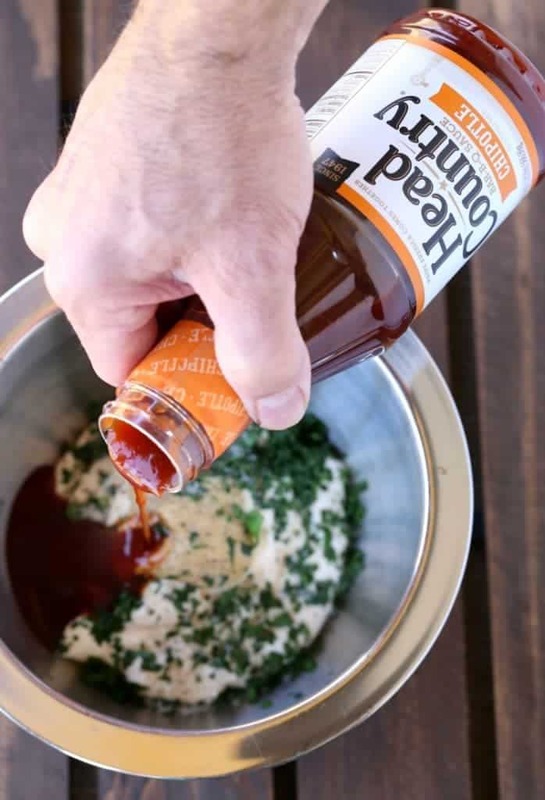 This Head Country BAR-B-Q Sauce I discovered at the store was perfect for this Oven Roasted Barbecue Potato Salad recipe, the chipotle flavor gave that sweet and slightly spicy flavor that I’m looking for to balance out the creaminess of the mayonnaise…and let me tell you guys, as much as I like barbecue sauce, it’s literally the best thing I’ve ever tasted. 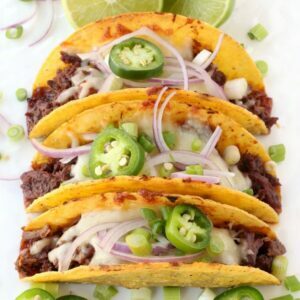 Just a few other ingredients are just ingredients, bacon – of course – celery and scallions. It’s not fancy, not a million ingredients, just the ones that matter. 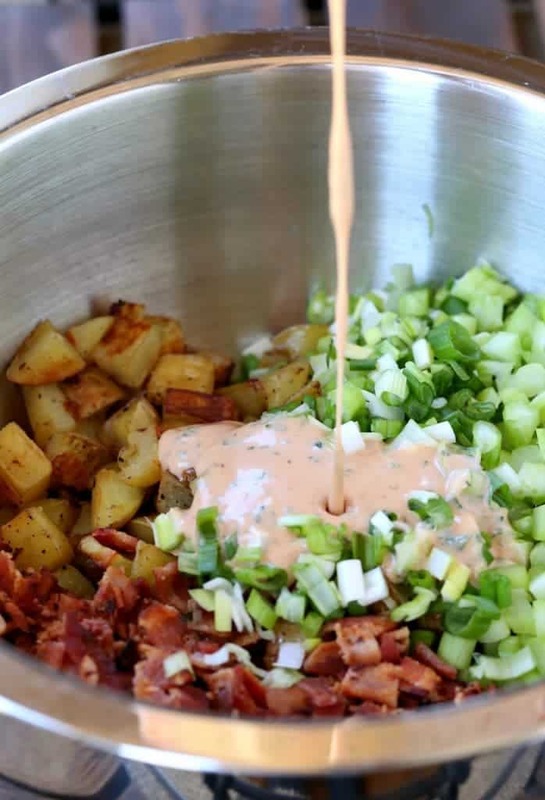 Once you pick your favorite – we went with the chipotle today – mix up the dressing ingredients and toss together with the potatoes, bacon, celery and scallions. Finally…you’re about to taste your ultimate potato salad side dish. Because the Head Country Bar-B-Que Sauce really gives this potato salad the most flavor you don’t need a lot of other seasonings in here. We’ve got grilling season on it’s way, so I’m sure I’m going to need a whole lot of this Oven Roasted Barbecue Potato Salad! 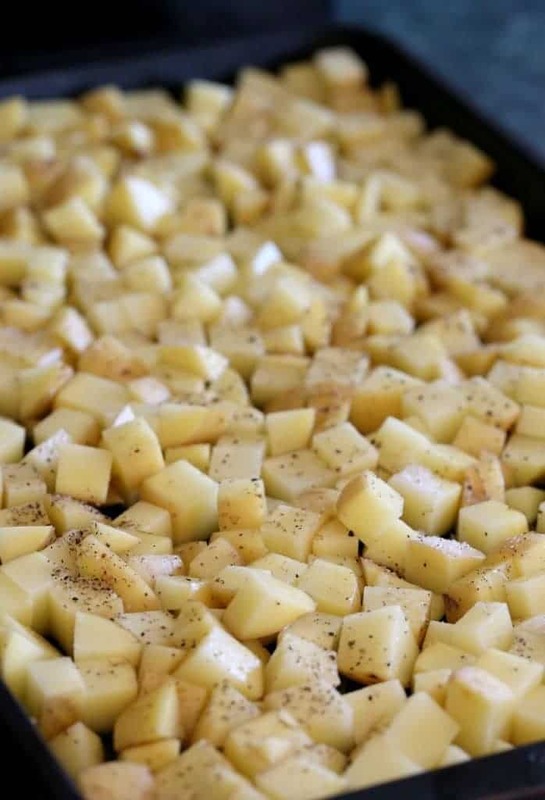 Toss the potatoes in a large bowl with the salt, pepper and olive oil then spread out onto 2 baking sheets that have been sprayed with cooking spray. Bake for 45-50 minutes, tossing twice in between cooking, until the potatoes are tender and lightly browned. Remove the potatoes from the oven to cool. 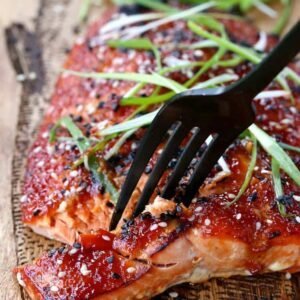 Make the dressing by adding the barbecue sauce, mayonnaise, dijon, parsley, salt and pepper to a bowl and whisking together. 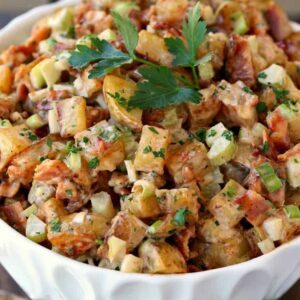 Add the roasted and cooled potatoes to a large bowl along with the scallions, celery and bacon. Pour the dressing over the ingredients in the bowl and toss together until well combined. Garnish with more chopped parsley. Serve at room temperature or chill and serve when needed. 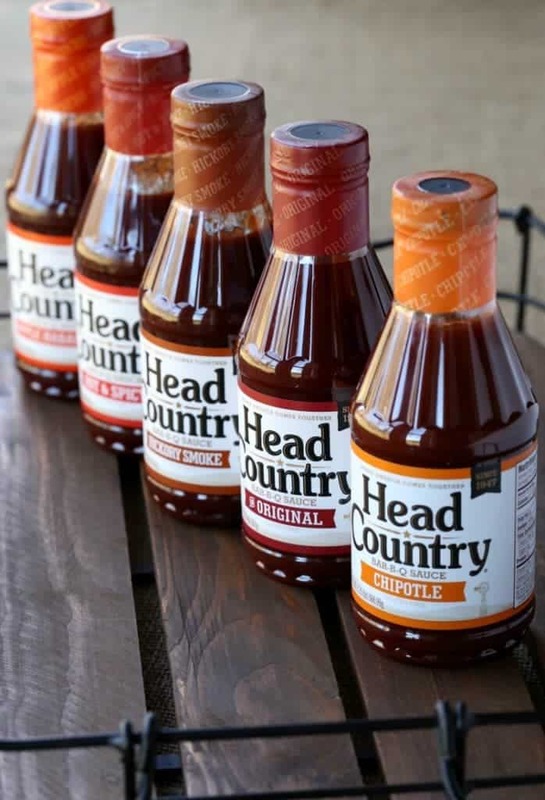 This post has been brought to you by our friends at Head Country Bar-B-Que Sauce, all opinions here are mine.